This website is designed to cover my professional and international careers in indoor and beach volleyball. It will also give information on my coaching philosophies and experience and introduce GMVA, an idea that I hope will open many doors for Australian Volleyballers to play overseas and achieve their goals as I have over the past 12 years. 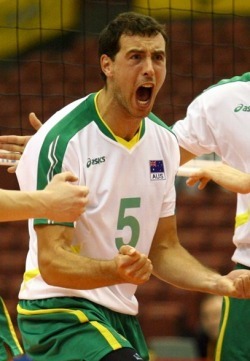 Since moving to the Australian Institute of Sport in 1998 when I was 18, I have been lucky enough to have countless fantastic experiences all around the world with volleyball. In 1998 I joined the National Team Squad as a junior, and in 2001 became a permanent Team member and starting 6 player. From 1998 through to 2008 I was involved in the most successful period of the National Team's history. I played in the teams that qualified in their own right for the 2004 Athens Olympics, competed in two World Championships (Argentina 2002 & Japan 2006) and won our first ever Asian Championship in 2007. In 2009 I played beach volleyball with the National Program in Adelaide and competed in 5 tournaments on the Swatch FIVB World Tour, in China, Poland, Norway, Finland and Holland.